Among the many beautiful, alluring tattoos available, the mandala is one of the most popular. In Buddhism, the mandala is a way to hone your focus. The geometric or floral designs draw your focus into the center of the mandala and aid meditation practices. While mandalas were originally used for religious art and meditation, they have grown increasingly popular with the New Age movement. Today, they can be found in a variety of tattoo designs and styles. The most common meanings of the mandala tattoo relate to spiritual matters. Originally, the word mandala came from a Sanskrit word. This circular shape represents balance, wholeness, eternity and perfection. Over the course of thousands of years, this symbol has been used in diverse religions like Buddhism, Christianity, Hinduism and Paganism. Buddhism: In Buddhism, the mandala is used in religious rituals and meditation. It is thought to be emblematic of the relation of human life and infinity. Since the cycle of life, death and rebirth is unending, the mandala’s circular shape is a perfect representation of that concept. In addition, the mandala is used to represent the balance of the mind, body and consciousness. Hinduism: In Hinduism, mandalas are often used to decorate meditation rooms or prayer rooms. They are used as a spiritual tool to promote mental focus. Christianity: In Christian religions, the mandala is often used in artwork that decorates churches and stained glass windows. Often, the mandala is a part of major scenes from the bible. Paganism: the sun, moon and earth are all circular shapes, so it makes sense that animistic and pagan religions would have used mandalas since the beginning of history. Often, elements like circles, triangles or squares are incorporated within the mandala. In Celtic religions, the mandala is often designed out of beautiful Celtic knots or natural elements. Tribal Designs: Many tribes around the world have used circles in their rituals, tattoos and ceremonies. In Maori and Native American designs, the mandala features prominently. Flower Designs: Since the mandala is a circle, it easily incorporates the circular shape of flowers. When used together, flowers and the mandala can represent eternity, balance and femininity. Keep in mind that flowers can also have meanings. While red roses symbolize romantic love, baby’s breath shows admiration. If you want to have a unique meaning, look up a flower that represents the feeling or emotion that you want your tattoo to convey. Celestial Bodies: The sun, earth, stars and moon are perfectly shaped for a circular mandala tattoo. 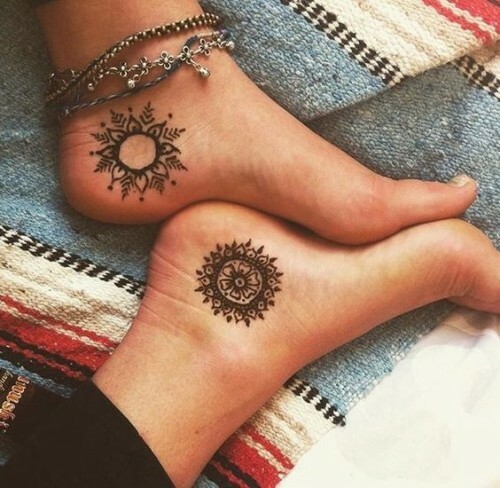 You can either create a sun or moon tattoo, or use a traditional mandala. If you want to make a sun, you could use a traditional mandala and draw rays that radiate outward to represent the sun. Depending on how you draw it, this could represent the enlightenment of meditation, hope or new life. Where Should I Put a Mandala Tattoo? When it comes to the tattoo’s placement, you are only limited by how large you want the tattoo and how small the body part is. Larger mandala tattoo designs are often drawn on spaces like the shoulders, ribs, spine, back, stomach or chest. 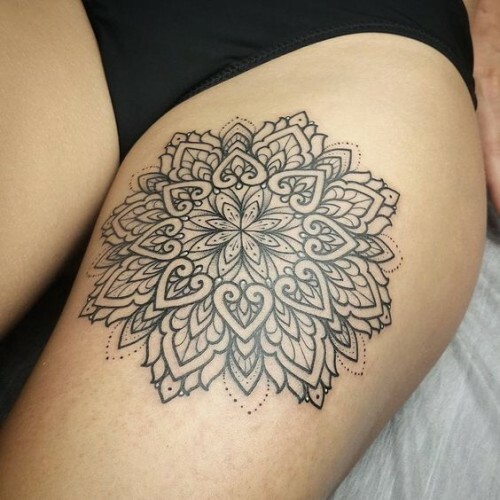 Since mandalas are normally very intricate, your tattoo artists will most likely want your tattoo to be larger so that it is easier to fit in all of the details. I want a mandala tattoo. I will get it on my birthday. Thanks. Thank you for sharing your thoughts and goals. Please feel free to let us know how everything goes. Have a great day, Samantha! Nice Article! Everything is so beautiful! Thanks for sharing the article!! Thank you for your positive comment. Please feel free to share your uplifting thoughts in the future. Have a great day, Mandala!